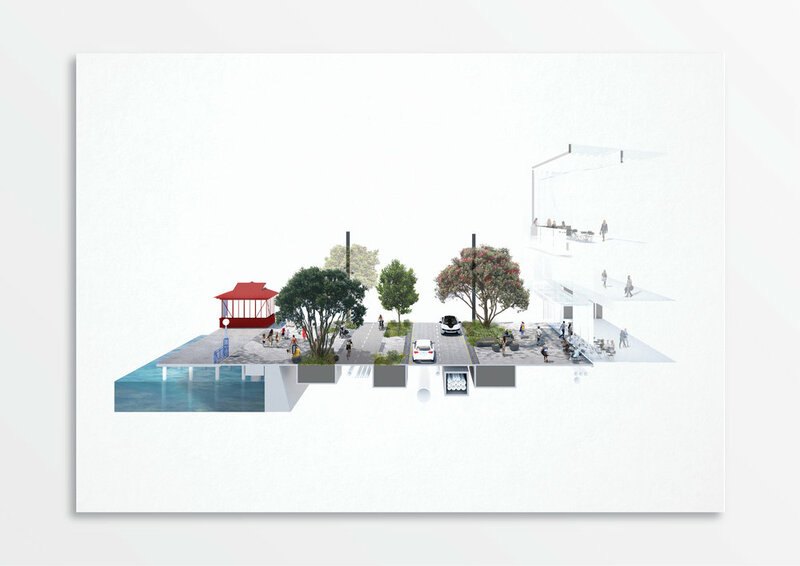 The conceptual design generators for Quay Street are informed and influenced by the sites underlying geology, cultural history and layers of landscape, city, economy and culture. A flexible surface for urban/waterfront life and strategic activation through the weaving, folding and layering of spaces and materials. Conceived as a layered spatial and graphically field that. The field is non-directional, and – like a tukutuku pattern – tells a story of the site/place that is informed by its landscape, urban and cultural context. This ‘field’ as a continuous, multiple, and dynamic layers contribute to the multi-levels of people. A shared and adaptable urban surface capable of supporting new enabling infrastructure, overland flows, low impact design, enhanced ecology/biodiversity, the movement of people, cyclists, cars and public transport and support human activity and occupation from the everyday to the event. Choreographed non-linear, programming and strategic activation provides for spatial variation, same v different and open v enclosed. A new emergent coastal/urban ecology that establishes an Immersive, high performance, ecological landscape corridor that connects east-west across the city centre waterfront, socially vital and ecologically rich. (Re)Connects Wynyard Quarter to Tāmaki Drive (east-west) and city to sea (north-south). Showcasing native vegetation. Exceeds ecological/stormwater treatment standards. Demonstrates best practice with site-specific innovation. Reinforcing the Mauri ‘life force’ of the waterfront.